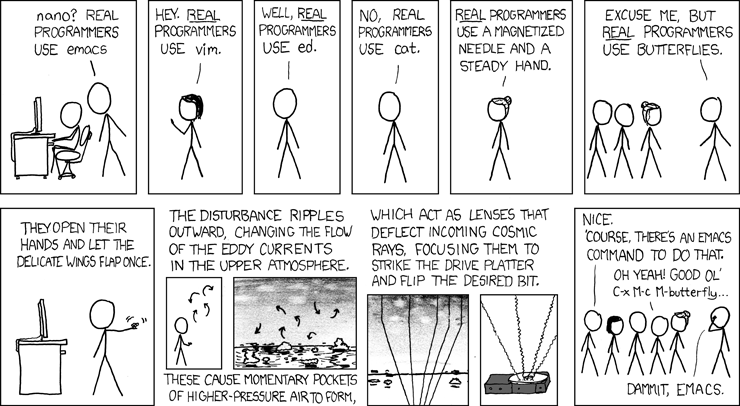 Emacs, the development environment for gods. I find myself completed fascinated by computer programming. I admire people who are awesome at it. I follow the culture. I’m desperate to learn it. I code in just about every waking moment not explicitly devoted to something else. I still lead a life, of some sort (wife, exercise routine, job), but few hobbies: the odd boxing match (5%), my blogroll (10%), this blog you’re reading (5%) and programming projects (80% of my free time). I am so frustrated with myself for not learning this years and years ago. Here I am in my 30s and scratching the surface of something immense. I will never be good at it… Never. Pathetic, he whispers dismissively, turns and waddles away. THAT’s Emacs. That’s the C library for XML processing I strangled my mind with the other day. Heck, that’s just about everything you do with C, which I’m desperate to learn but simply cannot see how I do that without spending months of dedicated evenings/weekends studying it. I have too many priorities. I have too little time. I feel stupid every single day.